Premise Martin, creator and CEO of Pedilicious Footwear, was part of a group of women who rang the Nasqaq bell last month. Premise Martin, creator and CEO of Pedilicious Footwear, enjoyed an exciting honor last month: She got the opportunity to ring the Nasdaq bell in New York City. She was one of a group of women selected by a group she's a member of, the Nashville Association for Female Executives (NAFE). 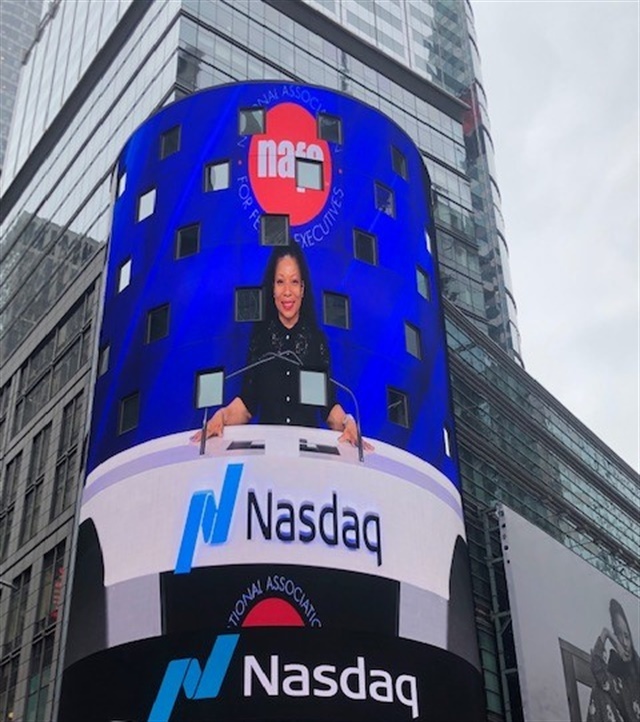 “For women’s History Month, they gathered a group of women they thought were very influential and inspirational to come ring the bell with them at Nasdaq,” Martin explains. One of NAFE’s vice presidents met Martin and was impressed by how she launched her product at a Macy’s in Atlanta on Super Bowl Sunday. See more of Pedilicious in the news here.